Posted 2/22/2018 11:22am by Cherry Valley Organics Farm. Here at the Cherry Valley Organics farm we take our lettuce very seriously. It's a staple in our Pittsburgh CSA Farm Share boxes all summer long. Yep, that's right. We provide fresh, organic lettuce to our customers for months, not just for a few weeks in the spring and fall when the weather is cool. We carefully select each of the gourmet lettuce varieties we grow here at the farm so that the salad bowl stays full even when the weather is hot. And this year, we're growing an even greater selection of gourmet lettuce varieties than ever before. What makes certain gourmet lettuce varieties truly exceptional? 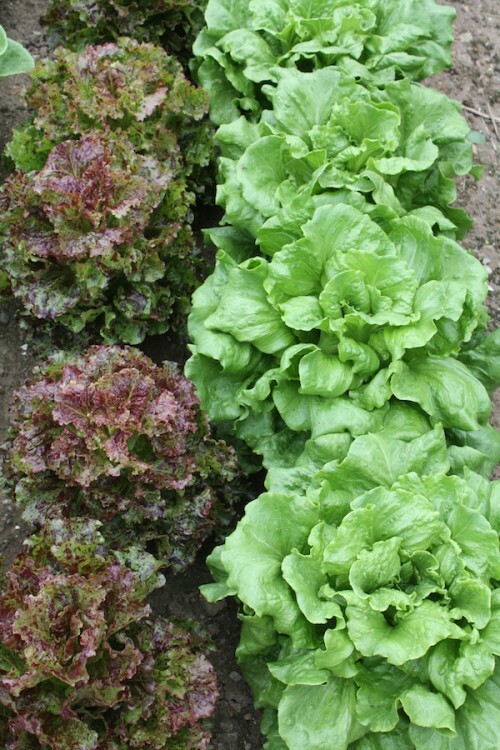 There are three traits we look for when selecting the best lettuce varieties to grow. Let's talk about each of these traits in turn. Heat resistance: Lettuce is a cool-weather crop that's notorious for turning bitter and going to flower as soon as the days lengthen and summer's heat arrives. 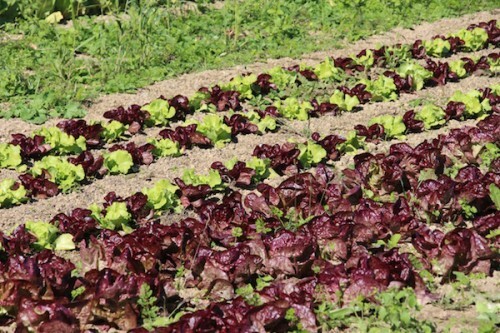 Thankfully, for both home gardeners and farmers like us, plant breeders have worked hard to develop heat-resistant lettuce varieties that keep producing delicious greens, even during warm weather. Bolting, or flower production, in these summer lettuce varieties is delayed and the flavor stays crisp and bright far longer. Flavor: In addition to having improved heat resistance, it's important that the gourmet lettuce varieties we grow here at our certified organic farm are flavorful. One of last season's farmers market customers said, "I love your lettuce because it has flavor. Most lettuce just tastes like water." Nothing makes us happier than hearing words like this from the people who feed their families what we grow! No lettuce is worth growing if it doesn't have superior flavor. Storage life: The final trait we use when deciding which gourmet lettuce varieties to grow on our farm is storage life. What's the use of having a bag of organic, locally grown lettuce if it's going to spoil in the fridge before you eat it? Not only do our individual lettuce varieties store well under refrigeration, but the baby leaf lettuce varieties we use in our salad mixes are long-lasting, too. We got an email last season from a customer who said they love that our lettuce is still good after more than a week. You won't find any brown edges or slimy dark spots in our bags of fresh-picked lettuce because of the gourmet lettuce varieties we choose to grow. 'Bergam's Green': This frilly green lettuce produces dense heads that hold up great under summer's heat and stay super crunchy. 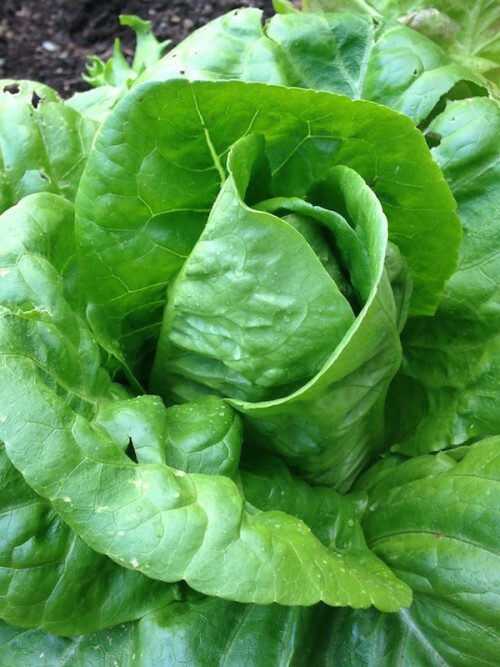 'Muir' is another excellent green lettuce variety we're growing this season. 'Vulcan': This gourmet lettuce variety would likely take the prize for the prettiest selection we grow. The mild-flavored leaves are frilly and edged in a deep red, and its shelf life after harvest is downright amazing. We're also growing another great red-leaved variety called 'New Red Fire'. 'Sylvestra': A Boston bibb lettuce, the thick, succulent leaves of 'Sylvestra' are a beautiful medium green. We think it has knock-out flavor, and the uniform size of the heads makes it easy for us to harvest. 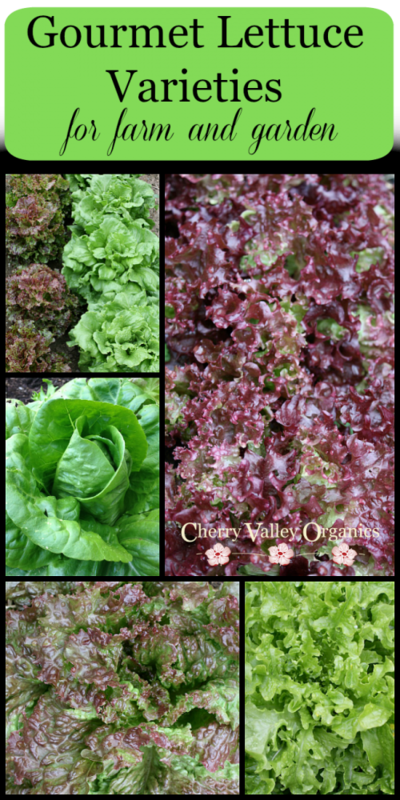 Other bibb-type gourmet lettuce varieties you'll find on the Cherry Valley Organics farm include a stunning red-leaved variety called 'Alkindus' and a loose-headed choice called 'Mirlo'. 'Green Forest': When gourmet lettuce varieties are being discussed, it's important not to forget about the Romaines! This upright, dark green Romaine lettuce is slow to bolt with an exceedingly crisp texture. It also stores really well. Other Romaine-type lettuces we grow are 'Jericho', 'Ridgeline', and 'Holon' (which is an excellent summer lettuce variety!). In addition to growing full-sized lettuce heads here at the farm, we also grow a ton of baby lettuce greens for our salad mixes. Tim is thrilled to be able to introduce three new lettuce varieties for our mixes this year. "These three varieties are going to change the way we grow salad mix. Our new mix for 2018 will have even more flavor and crunch than ever before." 1. 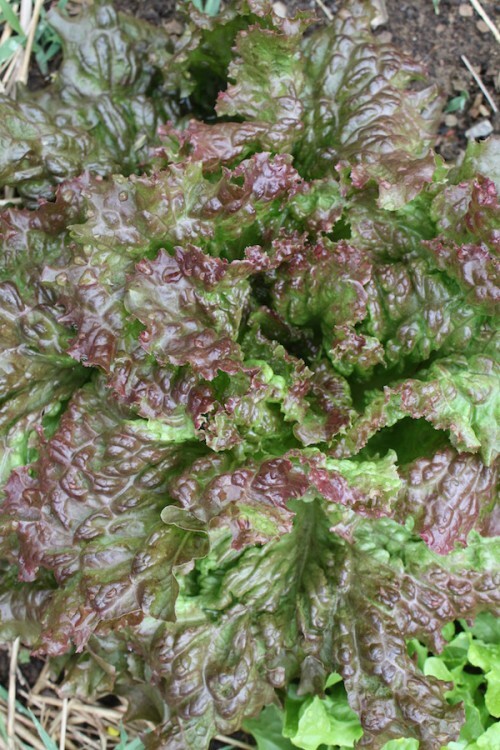 'Ezrilla' is a gorgeous medium green lettuce with intensely frilled foliage. It's slow to bolt, too. 2. 'Buckley' has wine-colored, oakleaf-shaped leaves. It's a real stunner in a salad mix! 3. 'Hampton' is prized for its glossy and ruffled leaves. 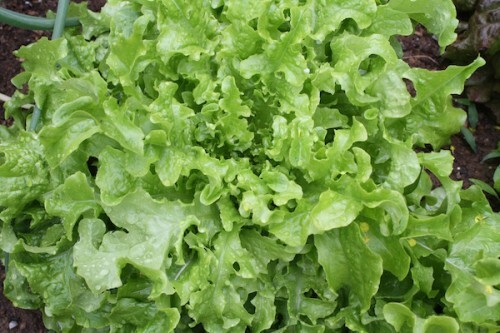 The heat-tolerance of this variety means a longer harvest of gourmet baby lettuce greens. As you can see, we pride ourselves on choosing the best lettuce varieties for our Pennsylvania farm so our customers can enjoy a steady supply gourmet lettuces from early spring through late fall. To enjoy our lettuce and salad mixes, Pittsburgh residents can stop by our in-season, Saturday morning farmers market stand in Sewickley, PA. Or, subscribe to our unique Farm Share program where we bring our organic produce to your family every week! Learn more here.